With his guru H.W.L. Poonja, affectionately called “Papaji,” this former TV broadcaster in Germany became immersed in effortlessness, and is effectively communicating this ease on speaking tours in the West and in India. Don’t concentrate on sadness, and don’t imagine or try to achieve happiness, he urges. Any kind of experience is a waste of time that can be spent going directly to your Heart. 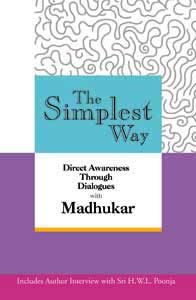 Madhukar’s teaching is so relaxed that he encourages people not even to relax. Relaxing is too much effort, he says. Any effort for someone who is already peace Itself is obviously unnecessary, and this spiritual teacher is not willing to settle for anything less than what already exists, which he calls our True Being, the Essence. Why this is not an actuality to most is pursued by him through the tangle of concepts and words we call our lives. Identifying ourselves with our moods, positive and negative opinions, the poison that is our doubts, and the tyrants called feelings are some of the aspects he identifies as the ego-centered programming of many lifetimes.